MPs and members of the House of Lords met to show their support for the UK’s submarine building industry, a key employer in the North West. 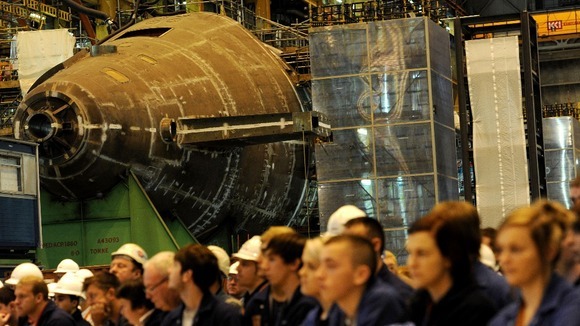 Politicians met with key figures in the industry and representatives of the supply chain and trade unions, who wanted to illustrate the chain of jobs that sten form submarine construction in areas like Barrow. The event was supported by BAE Systems and the Keep Our Future Afloat Campaign, a trade union organisation which campaigns to keep high-tech jobs in the North West and across the UK. Philip Dunne MP, minister for defence equipment, and Rt Hon Jim Murphy MP, Labour’s shadow secretary of state, were among those who spoke at the event to show their strong support for Britain’s submarine-based nuclear deterrent. All the speakers paid tribute to the cutting edge work of the firms forming the supply chain for the Astute-class submarines, currently under construction in Barrow, and stressed the importance for these firms of the Vanguard replacement programme. “It was fantastic to see so many MPs and peers from every corner of the country and all political parties coming to meet representatives of the firms and workers who form the supply chain for Britain’s cutting edge submarines. They will have been left in no doubt of the importance of the submarine programme to supporting British manufacturing and rebalancing the economy, as well as to securing Britain’s security – I hope they will bear this in mind when the time comes in 2016 to make a decision on renewing our at-sea nuclear deterrent. This entry was posted in UK Submarines and tagged Astute, BAE Systems, Barrow, Philip Dunne, Submarine, Vanguard on July 3, 2013 by jasonlockley.